An injured and alone 6-day-old horse was found Sunday in Fremont's Morrison Canyon, and Fremont Police have launched an investigation to determine how he ended up there. The horse, which Animal Control officers named "Valentine," has a broken pelvis and requires costly surgery if he is to live (see update below). According to a post on the Fremont Police Facebook page, the colt is believed to have been in the ravine for two days before he was discovered. He is presently being bottle fed by Animal Control staff, note the police. "The baby colt has a broken pelvis which is very close to an artery," reads the post. "We are hoping to have him seen at UC Davis on Tuesday or Wednesday at which point we'll have a better idea of our next steps. The surgery is expected to be in the range of about $10,000." A gofundme has been set up with the goal of funding the horse's surgery. 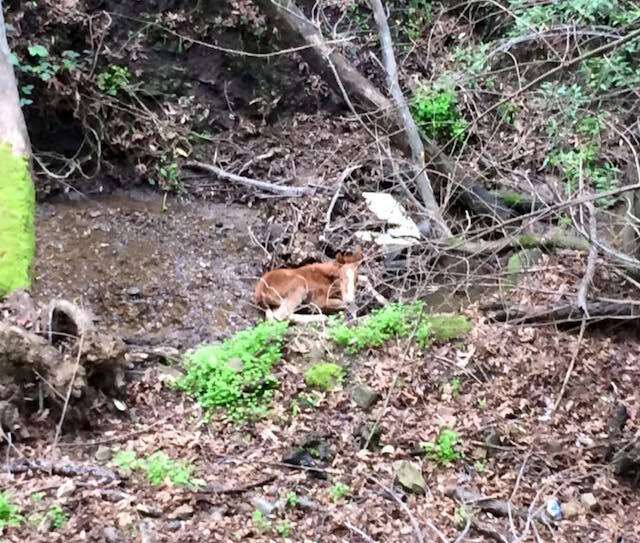 As to how the baby horse ended up in the ravine, Fremont Police think this is likely a case of accidental separation. Update: After a CT scan, it was determined that Valentine is not as badly injured as initially feared, and does not need surgery — rather a "long recovery."